With the unification of Egypt around 3100 B.C. rose a Mediterranean/African civilization classified today as ancient Egypt. Ancient Egypt prospered for about thirty centuries until its fall to Alexander the Great in 332 B.C. The history of ancient Egypt consists of periods of stability (Old Kingdom, Middle Kingdom, and New Kingdom) with transitional eras of disorder and instability (the Intermediate Periods). The Old Kingdom was a time when Egyptians started to build pyramids and monuments such as obelisks, temples, and the Great Sphinx. Egypt’s influence and power rose and pinnacled during the New Kingdom, when it was able to rival Empires such as the Mitanni, Assyrians, and Hittites. In its final era, ancient Egypt was continually conquered by foreign forces until it finally fell to Greek rule with the invasion of Alexander the Great, after whose death, his general, Ptolemy Soter, made himself the Egyptian ruler. The Ptolemaic Dynasty remained in power until 30 B.C. when Cleopatra’s rule ended with the invasion of the Roman Empire. The flourishing of the ancient Egyptian civilization was grounded in its ability to utilize the predictable flooding conditions of the Nile River. 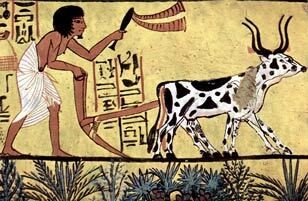 By optimizing the natural surplus of water through the construction of irrigation systems, the ancient Egyptians were able to harvest surplus crops, which in turn facilitated cultural and social development through the division of labor (less time spent farming). Through the leadership of scribes, administrators, and leaders under the guidance of the Pharaohs, the Egyptians were able to organize militaries and operate construction and agricultural projects. They also developed systems of mathematics, writing, architecture, construction, medicine, irrigation, literature, art, and established diplomacy with foreign groups.